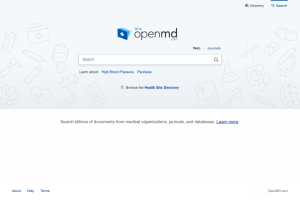 OpenMD.com, a medical search engine from the New York-based company of the same name, OpenMD.com, was launched in February 2019. OpenMD.com searches selected sources such as government agencies, global health organizations, medical journals, and reference sites to ensure that only reputable sources are listed. The results page offers an "All results" list on the one hand and on the other hand the results list can be restricted to journals. The web search in this collection is classified as a medical search engine, while the journal page has been categorized as a scientific search engine. When searching for medical terms, the results page displays definitions from medical reference works. An overview of the reference books used can be found under "Data Sources". In addition, images are displayed on the results page. The search results from journals can be refined using various categories, as is usual with scientific search engines and specialist databases. OpenMD.com is aimed at patients and medical professionals.